A yashmak, yashmac or yasmak (from Turkish yaşmak, "a veil") is a Turkish type of veil or niqab worn by some Muslim women to cover their faces in public. Today there is almost no usage of this garment in Turkey. Veil is a Persian custom adopted by Arabs. 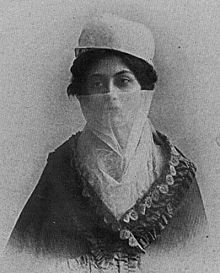 Unlike an ordinary veil, a yashmak contains a head-veil and a face-veil in one, thus consisting of two pieces of fine muslin, one tied across the face under the nose, and the other tied across the forehead draping the head. A yashmak can also include a rectangle of woven black horsehair attached close to the temples and sloping down like an awning to cover the face, called peçe, or it can be a veil covered with pieces of lace, having slits for the eyes, tied behind the head by strings and sometimes supported over the nose by a small piece of gold. ^ From an identical Old Turkish verb meaning indeed "to cover, hide". The original verb has become obsolete and a new verb, yaşmak-la-mak [segmented ad hoc], "to veil", has developed. ^ "Purdah | Islamic custom". Encyclopedia Britannica. Retrieved 2018-02-08. Adrienne Lynn Edgar (5 September 2006). Tribal Nation: The Making of Soviet Turkmenistan. Princeton University Press. pp. 235–238. ISBN 978-1-4008-4429-6. Gillian Vogelsang-Eastwood; W. J. Vogelsang (1 December 2008). Covering the Moon: An Introduction to Middle Eastern Face Veils. Peeters. pp. 61–63. ISBN 978-90-429-1990-7.